LORDSBURG -- Desert bighorn sheep destined for a captive breeding program at the Red Rock Wildlife Area north of here arrived Saturday, Feb. 26, after more than two months of quarantine in Mexico. The 10 young rams will provide new genes to a herd that was started at Red Rock in the 1970s. The rams were provided to the state of New Mexico in exchange for pronghorn antelope that were moved to three wildlife management areas in Mexico during the last two winters. The state of New Mexico started cooperative wildlife management programs with Mexican wildlife authorities in the 1970s. In 1972, desert bighorn sheep propagation at Red Rock began with five ewes from Mexico, and one ram from the San Andres National Wildlife Refuge on White Sands Missile Range. Offspring from the Red Rock herd have helped rebuild desert bighorn across New Mexico’s desert mountain ranges. The species once was considered endangered in the state, but after decades of releases, selective predator control, and the support of numerous wildlife conservation groups the animals are candidates for delisting under the Wildlife Conservation Act. Weybright said the Red Rock sheep need more genetic diversity. 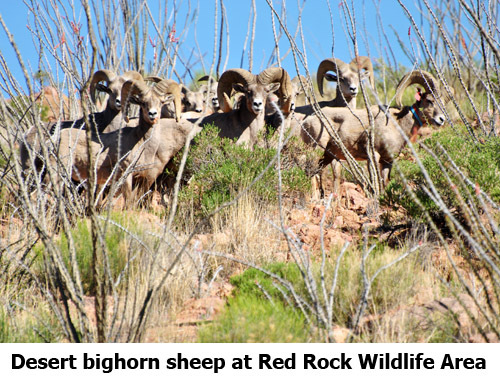 With the bulk of the sheep at Red Rock being from the San Andres, over the next decade offspring from the captive herd will be used to augment desert bighorn populations across New Mexico.